RAWRRRRRR!! I remember in high school watching the first Jurassic Park movie at a drive in (one of the last that was around). The fog had just rolled in when the T-Rex popped his head onto the screen with a loud RAWR!! The timing, the scene and the whole drive-in was shaking with fear!! It was the best movie (at the time) and a decent translation from the book (I always read the book before watching a movie based on it). This new No Bones About it stamp set was a MUST on my to-get list!! With Jurassic World now out - it's PERFECTLY timed (like the fog and T-Rex) to pop into our lives! 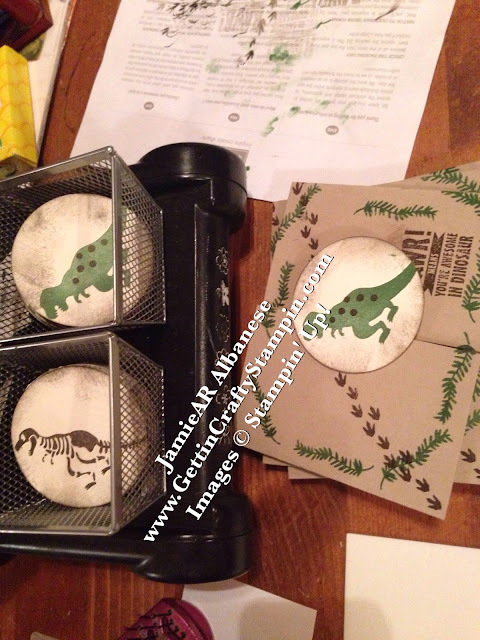 Enjoy this fun hand-crafted card that we did at our recent Stamper's 10 Club that translated to a fun SWAP at the upcoming Inspire, Create, Share Stampin' Up! Convention! OK so I love a good surprise! Here a simple scoring will create this cool 'reveal' type card! The Simply Scoring Tool makes it easy to score your card stock (along the 11" side) at 2-1/2 and 9-1/2" then cut across it at the 4-1/4" mark to create two perfectly scored cards that will have a cool door/tri-fold effect. I actually LOVE using the Simply Scoring Tool to score ALL of my cards - it makes for a crisp and more professional look! Having this fun bone/skeleton rubber stamped image appear on the inside flap is a nice surprise to who ever receives it. 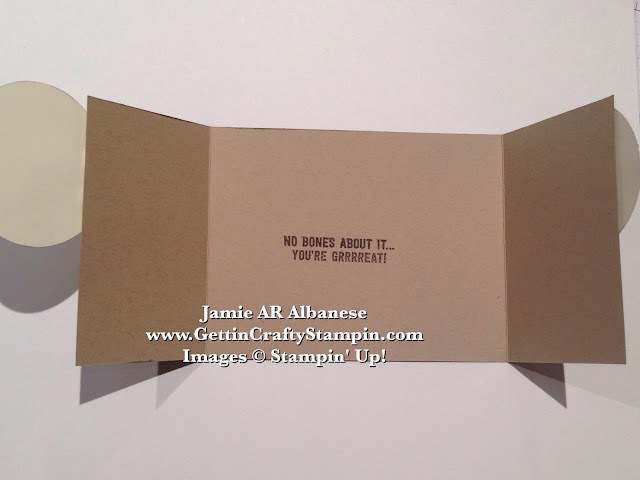 Using the Stampin' Sponge to make the edges distressed is easy to do! 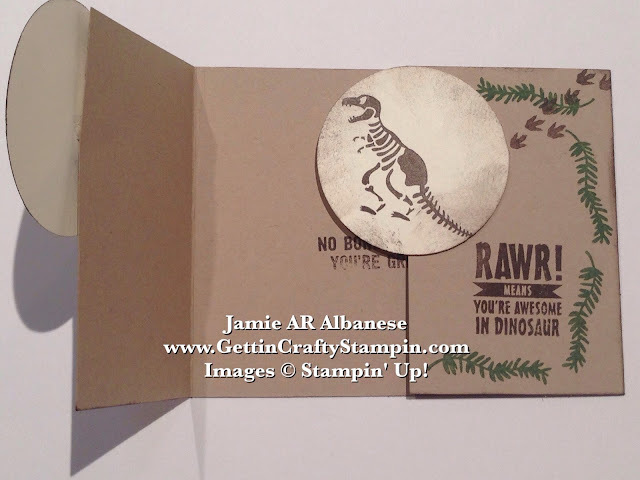 After stamping the dinosaur and skeleton on Very Vanilla with the Garden Green and Chocolate Chip ink pads, use the sponge along the 2-1/2" circle punched images and outside of the closed card for a rougher look! 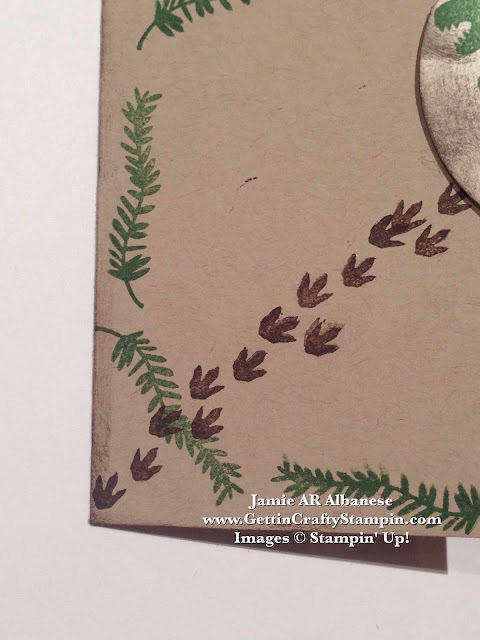 With coordinating ferns and track stamps you are limitless in how you create your hand-stamped card. My 9 year old daughter stepped up HUGE in helping me to stamp 50 of these Jurassic themed cards. My 7 year old daughter even sponged the circles and edges! My hubby helped me to 'fix' the dinosaurs that covered the words - lol - as I had a two classes and a luncheon to attend this past weekend (before heading off to Utah). I love that crafting is LIMITLESS in age and ability - we can all have fun rubber stamping and creating something awesome! I love a good pun - this cute No Bones About It is a fun sentiment on the inside of the card! I'm stumped, at times, what to write on the inside of cards. Having a sentiment gives my brain a break on witty things to say - lol. Send a dinosaur in the mail!! I discovered dinos in kindergarten and shocked my family as I quoted the full names of big prehistoric creatures that I became fascinated with. My kids didn't learn about dinosaurs in school during elementary but I love introducing the past to my children with the aide of museums! 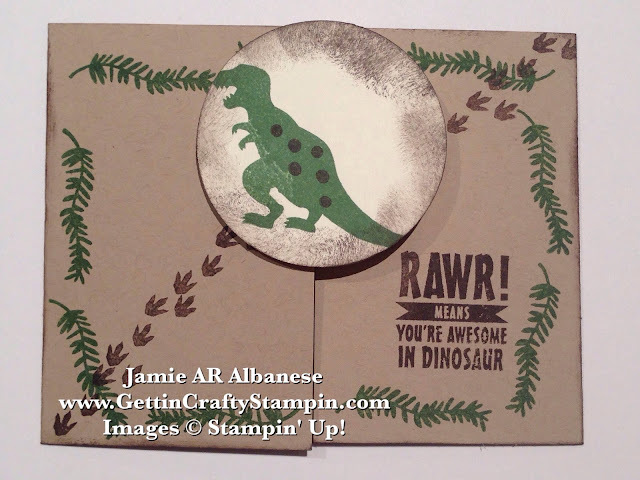 So for the kids in your life or the kid-at-heart (hello, everyone is going to see the Jurassic World Movie) this hand-stamped card is full of surprises that are sure to delight! Join us at club, at our in-person, to-go and on-line classes and send some love into the world (it's fun to surprise others with what you create! ).